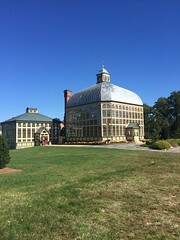 Established in 1888 as the Druid Hill Conservatory, the Howard P. Rawlings Conservatory has grown from the original Palm House and Orchid Room to include three greenhouses, two display pavilions and outdoor gardens. 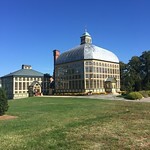 In 1874, Baltimore City park commissioners designated sufficient ground and proposed to establish a botanical conservatory in Druid Hill Park. The committee also directed George A. Frederick, the park architect, to design and make plans for the new building. Mr. Abbott Kenny, a member of the committee for the conservatory, traveled to Europe to visit the famous Kew Gardens of London, a model for the new design.